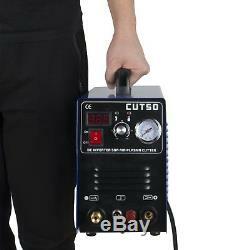 CUT50P Pilot Arc Plasma Cutting Machine110/220V & WSD60 Torch &Free Consumables. Max Cut Thickness: 1/2" , cut speed :7.8 in/minMax Severance Thickness: 3/4" , cut speed:3.9in/min, Automatic Dual Voltage / Dual Frequency (110/220V 50/60Hz). Compact plasma cutter uses non-hazardous compressed air to cut stainless steel, alloy steel, mild steel, copper, and aluminum. Designed for both demanding industrial and construction work, or home and hobby use. Pilot arc torch efficiently cuts though rough, painted, and rusty surfaces and produces minimal slag. MOSFET transistor produces a uniform output to enable cutting of thin metal and can reach high power output for cutting thick metal. 5.50-Ampere digital inverter air plasma cutter delivers smooth, clean cuts every time. Input power voltage(V, Hz):1-phases AC110/220V 50/60HZ. Rate input power capacity:10. Plasma cutting WSD-60P Torch x1. There will be no plug due to plug differences between countries. The item "50A Plasma Cutter Pilot Arc 110/220V CNC Compatible 3/4-Inch CUT + WSD60p torch" is in sale since Monday, April 23, 2018. This item is in the category "Business & Industrial\CNC, Metalworking & Manufacturing\Welding & Soldering Equipment\Welding\Welders, Cutters & Torches\Plasma Cutters". The seller is "susemselock" and is located in Rowland Heights, California. This item can be shipped to United States.